Perspective Renderings show the exterior of an architectural project—as it will be seen once it’s completed—kind of a future glimpse, if you will. Usually taken from a pedestrian eye level, an exterior rendering will indicate the materials and architectural finishes of the building, along with landscaping, trees, people, cars, and any surrounding existing context one would see. Sometimes these renderings are required to be part of a project’s submission for approval. They can also be very useful in communicating the “look and feel” that a finished project will have—well before its actual construction. These illustrations not only show the structure, but all the building’s detail, with shades and shadows—indicating the effect of sunlight on the building. Exterior renderings can be informative to the design process—allowing for review and reflection of all of the decisions regarding massing, architectural detail, landscaping, materials, color—all the major elements which are part of the design process. The process of creating an exterior perspective rendering begins with the architect’s plans and elevations. Once this information is input to a 3D CAD program, perspective views can be generated to be used as the basis for the rendering. Once a viewpoint is chosen, details and entourage, including landscaping and people, can be added to the chosen image. Upon approval, a freehand line tracing is done and submitted for the client’s approval. Finally, color is added, either color pencil or watercolor, based on information supplied by the architect or client. Once color is finished, a digital scan is usually made from the finished artwork and sent to the client. Original artwork can also be sent to the client, if desired. 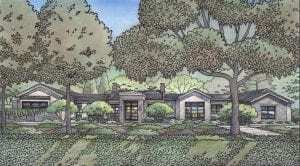 Although exterior renderings can be computer-generated, hand-drawn and hand-colored renderings are more successful in capturing the life and spirit of a place or building. This is partly due to the fact that the public responds more favorably to hand drawings and paintings as opposed to their computer-generated counterparts.